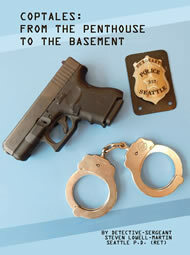 Steven Martin's non-fiction book, memories and reflections as a 31-year Seattle police officer and detective. The characters he introduces range from strange to hilarious to famous. A must-read for any person considering a career in the police force! Government, academic, and religious leaders convene far beneath the earth’s crust in a super-secret catacomb at the invitation of the National Security Agency to be witnesses to the impossible. Suddenly, the world’s most advanced listening post is privy to every conversation in history. But some stories are better left alone. The greed-driven corporate ruse that was 9-11, Bin-Laden, and the resultant gulf wars is unexpectedly revealed. A triad of mega-billionaires proves willing to pay with their fortunes or the blood of innocent witnesses in order to conceal their scheme. The truth behind the resurrection of Christ is similarly revealed. The Vatican soon becomes an unwitting participant in the man-hunt for the project’s founders. Stanford Physicist Gordon Huard and corrupt NSA Director Michael Portworth are propelled into worldwide exile. They are reunited by the most unlikely of sources and drawn together to bring down the “New World Order,” inclusive of a sitting President. FOUR POUNDS OF PRESSURE available from Amazon.